When you look for Baltimore veterinarians, it helps to choose an animal hospital that will not only provide basic care for your pets, but who also is in the position to help you out when the unexpected happens, over even when you need to get away without your pets. At Village Vet Baltimore Animal Hospital we strive to be that kind of vet for our patients and their owners, Our Baltimore veterinarians provide many of the standard services to families in Baltimore as well as Mount Washington, but also offers daycare and overnight boarding services for both cats and dogs, And unlike some vets in the area, we don't limit our practice to canines and felines, but are here to care for many of your other pets as well. 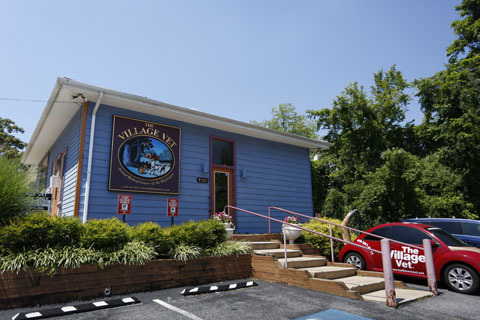 Whether you are a cat or dog person, our three veterinarians and our supportive staff at Village Vet Baltimore Animal Hospital are ready to meet you and your brood. He is our practice owner and first received his DVN degree in 1981 and has worked as a veterinarian in several capacities since, including as an emergency vet at EVC in Catonsville, a clinic where we maintain a strong connection with to assure that pets receive quality emergency and follow up care. Kenneth became a vet in 2011 and focuses closely on the dental health of pets and how it contributes to overall health. In addition to our Baltimore veterinarians, Village Vet Baltimore Animal Hospital also has a strong supportive staff with a hospital manager, technicians and receptionists that have a long history or love for animals both at work and in their home lives. While regular vet care such as vaccinations, well puppy and kitten visits, annual checkups, parasite control, and dental care are all vital parts of any pet's care there are times when pets need something extra. Either they are facing an emergency situation, are suffering from an illness, or even if they need to be boarded for the day of even longer. Our staff handles emergencies during our office ours, and works closely with other facilities when we aren't open in order to provide consistent care. We also provide boarding services to give pet owners the peace of mind that their pets are being cared for by vets and staff they have come to know and trust in a healthy environment where they get the exercise and attention they need. In addition we also reach out to men and women that have served in the military through our partnership with the Pets for Patriots program.